After a neuron fires an electrical impulse, this impulse needs to be chemically transmitted to another neuron to propagate into the neuronal circuit; otherwise communication would grind to a halt. In a paper published on May 10, 2012 in the journal Neuron, researchers at OIST identify a critical part of that chemical transmission. At a meeting point called a ‘synapse’ messages are passed from a presynaptic neuron to a postsynaptic neuron. There, presynaptic neurons encase a chemical ‘neurotransmitter’ in a membrane packet called a ‘vesicle,’ which, when triggered by an electrical impulse, merges into a presynaptic neuronal membrane and releases the neurotransmitter into the synaptic cleft, a process called exocytosis. Tomoyuki Takahashi, head of the Cellular and Molecular Synaptic Function Unit, explains that “to keep synaptic transmission going at high frequency for many minutes and hours without a failure,” a presynaptic neuron needs to counterbalance exocytosis with endocytosis, in which pieces bud off from the presynaptic membrane and re-enter the neuron to be re-used (Figure 1). To find out how the cell maintains this balance, Prof. Takahashi, researcher Kohgaku Eguchi, and their co-authors studied an auditory relay synapse visualized in a brain slice. They injected inhibitors into the presynaptic terminal in order to search for a protein that can accelerate endocytosis. The key turned out to be the protein cGMP-dependent protein kinase (PKG). PKG doesn’t accomplish exo-endocytotic balance alone: it’s part of a complex chain of signals that links exocytosis with endocytosis. Upstream of PKG, the researchers found, the postsynaptic neuron produces the gas nitric oxide in response to the neurotransmitter glutamate. Nitric oxide flows back to the presynaptic neuron across the synaptic cleft and activates PKG in the presynaptic neuron (Figure 2). This new role for nitric oxide, already known to be an important signal molecule in the cardiovascular system, is the most significant finding in the new paper, says Prof. Takahashi. He adds that while the research was done on a specific synapse, the findings should hold true for other synapses as well. Taken together, the work answers a fundamental question about brain function, showing how neurons are able to keep vesicle endocytosis in sync with exocytosis and keep on signaling. 2 Department of Neurophysiology, Faculty of Life and Medical Sciences, Doshisha University, Kyotanabe, Kyoto, 610-0394, Japan. This research was partially funded by the Japan Science and Technology Agency (JST)’s CREST (Core Research for Evolutional Science & Technology) project, and was conducted by Dr. Kohgaku Eguchi and Professor Tomoyuki Takahashi and other members of the OIST Cellular and Molecular Synaptic Function Unit. Prof. Takahashi also serves as faculty of the Graduate School of Brain Science at Doshisha University. A synapse is a junction through which a neuron passes information to another neuron. Presynaptic terminals contain chemical neurotransmitters enclosed in small spherical intramembrane structures called synaptic vesicles. When an action potential, a wave of electrical excitation, reaches the presynaptic terminal, the membranes of some synaptic vesicles fuse with the membrane of the presynaptic terminal, thereby opening the vesicles (exocytosis),which release their neurotransmitter contents into the synaptic cleft, the space between the pre- and postsynaptic cell membranes. The neurotransmitter diffuses into the cleft and binds to receptors located on the postsynaptic membranes. 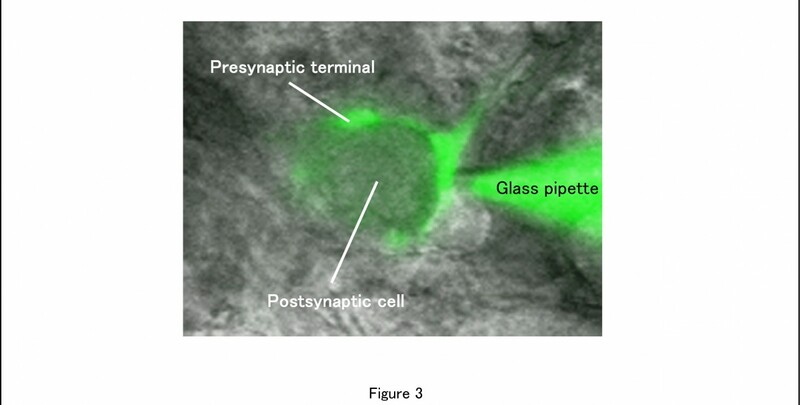 The fused membranes of synaptic vesicles are retrieved in presynaptic terminals (endocytosis) to be reused. Maintaining the balance between the amount of exocytosed vesicles and endocytosed vesicles is essential for continuous neurotransmission. Neuronal information is usually passed anterogradely from presynaptic cells to postsynaptic cells, but there are retrograde signals conveyed from postsynaptic cells to presynaptic terminals. Nitric oxide (NO) is one such signal molecule, and as we demonstrated in this study, it regulates vesicle endocytosis in the presynaptic terminal. 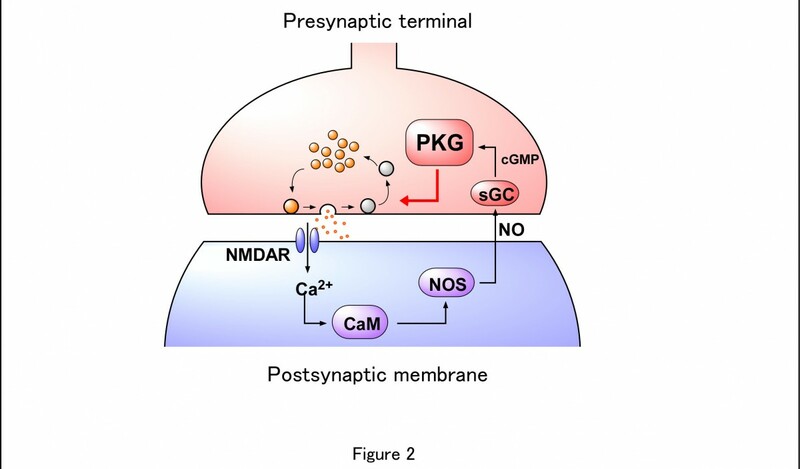 After the neurotransmitter glutamate is released from the presynaptic terminal, it binds to postsynaptic NMDA receptors and induces Ca2+ influx into the postsynaptic cell. The high calcium concentration activates calmodulin (CaM), thereby promoting NO synthesis by activating NO synthases (NOS). NO is diffused into presynaptic membranes and activates soluble guanylate cyclase (sGC), which synthesizes cyclic GMP (cGMP) from GTP. Increasing cGMP activates cGMP-dependent protein kinase (PKG), thereby accelerating vesicle endocytosis. The extent of this feedback regulation depends upon the amount of glutamate released. Thus, the NO-PKG retrograde pathway couples exo-endocytosis of synaptic vesicles for the maintenance of long-lasting synaptic transmission. In this study, the researchers used a giant synapse called the “calyx of Held” in the auditory brainstem of rats. This presynaptic terminal is large enough for optical identification in slices and allows patch-clamp recordings from the presynaptic terminal. In this figure, a fluorescent dye had been injected into the presynaptic terminal via a glass pipette.